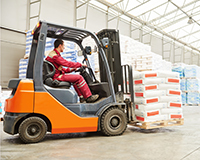 Forklifts are a crucial part of warehouse and material handling operations. They give warehouse associates the ability to pick up, move and raise pallets of merchandise as well as load them onto pallet rack levels that are at varying heights. Forklifts can be powered with gasoline, diesel, propane or electricity (by way of battery). They have various lift heights and load capabilities. Forklifts are designed for specific weight loads that must not be exceeded. Surface conditions determine the type of tires required. A counterbalance forklift truck is the type of truck most people envision when they think of a forklift. A counterbalance truck has forks protruding from the front of the truck and does not have outrigging arms or legs. This gives the forklift the ability to be driven to the exact location of the merchandise or racking. This type of forklift is available in gas, diesel, or electric powered models. They can also have sideshifts, mast tilt, and driver cabs. Growing environmental regulations have created a need for materials handling systems that leave a smaller environmental footprint. An electric forklift truck meets that need. With a rechargeable battery, electric forklifts are a viable cost and energy saving solution than to that of traditional internal combustion forklifts. 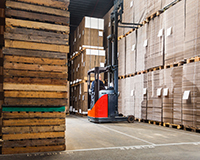 Narrow aisle forklifts do just what the name implies: make hard to reach storage areas accessible, including high bays, coolers, freezers, and small spaces. They range in capacity from 2,500 to 4,500 pounds. Designed mainly for warehouse operations, reach trucks provide maximum lift height and excellent maneuverability. They have a combination of reach capability and stabilizing legs that lets them lift to heights in excess of 30 feet while operating in tight working environments. Sideloaders are trucks that pick up loads from the side. They are efficient in handling long or wide loads that would be unstable on a counterbalance machine. They can handle piping, sheets, and timber but have limited flexibility for handling a variety of more conventional loads. As forklifts offer more options and attachments for increasingly various racking systems, it is increasingly important to have an in-depth understanding of forklift load capabilities and capacity and the potential risks involved in exceeding them. This knowledge will determine the safety level in your workplace, therefore it is imperative that you are aware of the risks of exceeding the capabilities and capacity of the forklift you use. Our forklifts offer an ergonomic design that offers both safety and comfort for your employees. Contact us today to discuss the forklift that meets your needs. Everything Warehouse offers low pricing on all of our forklifts, both new and used. We offer forklifts for a variety of industries such as retail, steel, energy, pharmaceutical, and oil. We pride ourselves on delivering the highest customer satisfaction.